BBQ beef brisket cooked over a slow, smoky fire? Nothing better. But when the weather is cold—as it currently is throughout much of the US—most of us don’t venture outside to tend a smoker or grill. We’re happy to turn on the oven, though. Which is handy, because brisket “barbecued” in the oven can have flavor that’s almost as good as the outdoor kind. It even takes a bit less time to make. And it requires very little attention from the cook. That gives you more time to enjoy other things—like chatting with your guests at the annual Super Bowl party. This year, maybe you’ll even get to see the whole game. This recipe is a riff off our Oven Slow-Cooked BBQ Spare Ribs and Oven Slow-Cooked BBQ Pulled Pork. As noted in those recipes, people often use the term “barbecue” for anything cooked outdoors on a Weber. But most of the time, what we’re actually doing is grilling—i.e., cooking meat over relatively high heat. By contrast, when you barbeque meat, you cook it at low heat (typically 200 to 225 degrees F) for several hours. This slow-cooking process infuses the meat with flavor, and breaks down fibrous connective tissues that make some cuts of meat tough. This recipe uses a small amount of liquid smoke to help flavor the meat during the cooking process. Good liquid smoke is a natural product, containing nothing but water and natural smoke concentrate. But do read the label; cheaper brands include chemicals you don’t want to use. Warning: As the brisket cooks, your oven will emit a wood-smoke aroma (mild, but distinct). If you’re allergic, or the idea of this smell drifting through your house doesn’t appeal, omit the liquid smoke in Step 5 of the Procedure. For this recipe, you’ll use a “rub” to season the meat, and it’s best if you apply it the day (or night) before you plan to cook the brisket. You can create your own recipe for the rub, or use one of our favorites, which we describe below. Preparation time for this recipe (making the rub and applying it to the beef) is about 20 minutes. Then the rubbed brisket needs to rest in the refrigerator overnight before cooking. Cooking time is about 1 to 1½ hours per pound of meat. So this recipe does take a bit of time (though most of it is unattended). This recipe yields 8 or more generous servings. Leftovers store well in an airtight container in the refrigerator for a few days. Steps 1 through 3 should be accomplished several hours before you plan to start cooking the brisket. Ideally, the rub-coated, uncooked beef brisket should rest in the fridge overnight. The night before you want to cook the brisket, prepare the rub: Combine all ingredients except the liquid smoke, then mix thoroughly until well blended. Coat the beef brisket: Remove the brisket from its packaging. Rinse and pat dry. One side of the brisket usually has a layer of fat on it (called the fat cap). Trim off most of the fat cap, but leave about ¼ inch on. If using the optional liquid smoke, pour about half a tablespoon on the fat side and rub it in with your hands. Turn the brisket over, add another ½ tablespoon liquid smoke and rub it in. Next, with your hands, pat the rub onto all sides of the brisket (more on the meatier side, but make sure the fat side receives a good share too). You’ll want to use at least ¼ cup of rub, but use more if you wish (see Notes). Reserve any unused rub for another purpose. Place the brisket in a heavy-gauge food-storage bag (we use 2-gallon freezer bags), squeeze out as much air as possible, and fasten the top of the bag. Refrigerate the brisket overnight. Half an hour before you want to begin cooking the brisket, preheat the oven to 250 degrees F and remove the brisket from the refrigerator (so it can warm up). Place the beef brisket on the wire rack, fat-cap side up (again, make sure it doesn’t touch the broth or water). Tent the brisket and the rack with a sheet of aluminum foil, crimping around the edges to keep steam from escaping. Place the roasting pan in the oven and set a timer for 3 hours. At the 3-hour mark, remove the foil. Insert the probe of an instant-read thermometer to determine how the brisket is coming along (you want it to reach at least 200 degrees F; we often cook it to 205 degrees F, sometimes a bit higher than that). If the brisket is not done yet, return it to the oven until it reaches the appropriate temperature (leaving the foil off). Timing note: Total cooking time is usually 1 to 1½ hours per pound, but start checking after 1 hour per pound. If the beef is taking too long to cook, you can increase the oven temperature to 300 - 325 degrees F to hurry things along. In some cases, brisket will cook a bit faster than you expect it to. If that happens, turn the oven down to 225 (or even 200) degrees F.
Once the brisket is done, you can serve it at any time. If you need to wait before serving it, remove the brisket from the oven and wrap it in aluminum foil. You can hold the cooked beef brisket in a 180-degree F oven for up to 3 hours (see Notes for additional suggestions). When ready to serve, remove the cooked brisket from the oven and discard the broth or water (but see Notes). Let the brisket cool at room temperature for 20 minutes. When cutting the brisket, slice it across the grain. A whole brisket has two parts: the point muscle and the flat muscle. You’ll most often see the flat cut at the supermarket, and we think it’s the better choice for BBQ brisket. Flat-cut brisket has a nice uniform grain that makes it easy to slice (and we recommend slicing across the grain). It also has great flavor. You can use a whole brisket in this recipe, but that’s a large piece of meat—at least 8 pounds, usually more like 12 to 16. A whole brisket will yield enough for a mob (and it will take quite a while to cook). Whole brisket also won’t slice up as nicely as the flat cut. That’s because the grain of the point and the flat parts run in different directions. To further complicate things, there’s a large layer of fat between the two muscles. Beef in the US is inspected and graded by the USDA (United States Department of Agriculture) at the meat packing house. Prime (the highest grade) has abundant marbling (veins of fat) throughout the meat. Marbling is a good thing since fat (in moderation) adds flavor and tenderness to beef. Only a small percentage of the meat produced in the US is graded Prime—and most of it goes to restaurants and fancy meat markets. So it’s unlikely you’ll see it at your local grocery. Choice is the next best grade, and it’s what most of us see in the supermarket. It has less marbling than Prime beef, but it’s still plenty tasty. It works well in this dish. Next down in grade is Select—and lately we’ve been seeing more of it in supermarkets (probably because meat prices have increased, and it’s a cheaper cut). Because Select has much less marbling, its flavor and tenderness are inferior to that of Choice or Prime cuts. Avoid it for this recipe. The rub in this recipe contains both pimentón (smoked Spanish paprika) and dried chipotle chile powder (made from smoked and dried jalapeño peppers). The naturally smoky flavor of these ingredients helps flavor the beef. Hickory-smoked salt has terrific flavor. But it's often hard to find in grocery stores. If you’d like to try some, Google (and the reviews at Amazon) are your friends. We ended up buying a pound of the stuff, and store it in the freezer to help preserve its aroma. The recipe for the rub makes more than you’ll use for this dish. You can store the rest in an airtight container at room temperature for a couple of weeks. It will keep even longer if you refrigerate or freeze it. We tend to use a lot of rub—about half a cup for a 4-pound brisket. It adds a nice, spicy crust. You should use an instant-read thermometer when slow-cooking brisket (or any barbecue meat) because you really need to know what is going on temperature-wise. We like the (rather pricey) Thermapen—its temperature sensor is at the tip of the probe, so you can position it accurately, and it records a temperature within 3 seconds. It’s also exceptionally accurate (within about one degree). We received one of these as a gift several years ago, and find it indispensable. BTW, we have no connection with the makers of Thermapen, nor do we gain financially (or in any other way) from mentioning it. We’re just extremely happy users of their product. If the brisket gets done too quickly and you don’t want to hold it in in the oven (Step 9), you can wrap it in aluminum foil, then put it in an empty picnic cooler. When a cooler is covered (and, obviously, contains no ice), it will keep brisket warm for several hours. Alternatively, you can let the brisket cool, then refrigerate it in an airtight container (we like freezer bags). When you’re ready to serve, just pop the brisket into a 300-degree F oven for half an hour or so to warm it up. We’ve cooked brisket using both hot beef broth and hot water (Step 5). The broth adds some flavor, so that’s what we suggest. To make beef broth, we generally heat water, add it to the roasting pan, then add some beef base to the water along with the liquid smoke. When the brisket is finished, we recommend discarding the cooking liquid. However, you may want to remove the fat and taste it—the liquid is quite flavorful. We find it a bit too smoky for our tastes, but you may like it. What sauce should you serve with the brisket? We like to use our Tangy Barbecue Sauce. But your favorite barbecue sauce will work just fine. 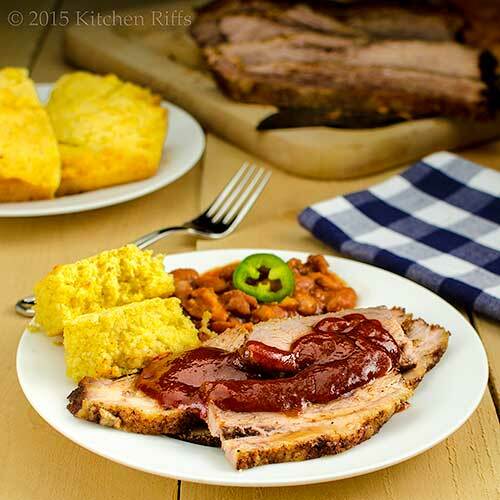 Beef brisket goes well with any number of side dishes. We like to serve it with Green Chile Chili Beans, Garlic Coleslaw, or American (Mayonnaise) Potato Salad. Cornbread is also a great accompaniment—particularly Jalapeño Cornbread. 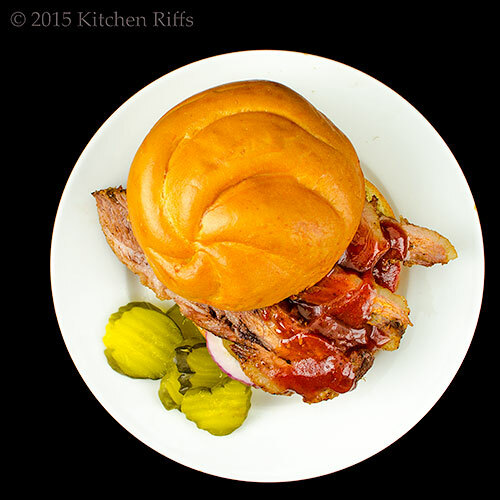 Prefer to serve your brisket in a sandwich? Soft white bread is the classic choice (many people opt for Wonder Bread or the like). We tend to prefer a nice sturdy Kaiser roll, however. Just add barbecue sauce, sliced onion, and maybe a pickle or two, and you’re all set. “I’ve got no beef with it,” said Mrs K R.
“I bet we’re going to butcher some more puns before this is over,” said Mrs K R.
“Where’s the beef?” she replied. That Mrs K R. She moo-ves me. This is a very good recipe not only to eat but to warm up the house as well :), it is freezing today and I was thinking of making something in the oven, will try your recipe for sure. This is winter comfort indeed. Although even in MN, we do use the outdoor grill. It's sitting on the patio next to the back door! Paul uses a flashlight to see the meat. This will be made before the winter is over (we have until - you know - May, June). Like the idea of the smokey flavor. P.S. One can never have too many puns. Hi Nee, this recipe really is a winner -- loads and loads of flavor. Have fun with it! Thanks for the comment. Hi Amira, I love recipes like this when it's cold outside! You're right -- first the oven comforts the house. Then the dish comforts you. ;-) Thanks for the comment. Hi Claudia, glad you like the puns! We obviously do. ;-) And we do use the grill outside sometimes in the winter, but for a dish like this prefer the oven. Thanks for the comment. Are you telling me I don't have to bundle up in coat, gloves and boots? I'm all ears. Sort of kidding but not. I still grill all winter; I'm sort of like the mailman. But for slow cooking I'm all about the oven too. Your rub sounds terrific; I love to mix them up. So...how about doing this in a slow cooker...ever substituted that for the oven John? Your conversations crack me up. Always end your post with a smile :) I love brisket, and you are right it does get done fast. I made one one time and it was ready an hour before I expected it to be. I have always wanted to make brisket at home. I'm excited to check this recipe out! We don't get the cold you do but we don't HAVE smokers Down Under!! Well, very few people do :) So I jump on any oven version that looks great - and this looks GREAT! And from a trustworthy source too, because I know we have similar tastes :) Definitely giving this one a go!! Sorry, me again! One question - after taking the foil off, do you give it time in the oven to crisp up the outside? Because I imagine if you only cook it with a foil tent, then the crust is wet rather than dry? Thank you! This sounds seriously good, John. I don't care if it's summer downunder... I want! I have to try your recipe one of these days. My family and I love briskets. Hi Barb, never did this in the slow cooker. But you know someday I will. :-) And I'll grill outside in the winter, too, but slow cooking is something else! Thanks for the comment. Hi Uru, you've been having another hot summer, haven't you? Definitely something to keep in mind for when you want a nice, warm oven. Thanks for the comment. Hi Nazneen, the timing of this sometimes will really fool you -- a bit tricky to cook in that regard. Although cooking this one just a bit too long is OK (I've done that). Love the idea of BBQ chicken pizza. We'll be using the bbq sauce next week in bbq brisket chili. ;-) Thanks for the comment. Hi Laura, it's a really tasty recipe -- perfect for your cold winters! Thanks for the comment. Hi Nagi, brisket is great on a smoker! Use the same rub, just control the fire so it's 200 degrees F or so. And use indirect heat if possible (or a water reservoir). Thanks for the comment. Hi Nagi, usually it needs another hour or so in the oven after I remove the foil, so yes, it does crisp up. Although it's pretty good with a wettish crust too (which of course is different from the dry "bark" you get with a smoker). Hi SuperLux, this really is hard to resist. Try it -- your tummy will thank you. ;-) Thanks for the comment. Hi Lizzy, it is seriously good, it is! ;-) Thanks for the comment. Hi Denise, brisket is such good stuff, isn't it? And this recipe is wonderful! Thanks for the comment. Yes, this does sound 'udderly' delicious. I didn't know there was such a thing as liquid smoke, I'll have to give it a try. Sort of reminds me of the 'smell-o-vision' thing they tried to get going in the early 60's. There I go again, reminiscing! I love the recipe, and can't wait to try it. Bookmarked. Now that I've calmed myself down after all those beefy words between you and Mrs. K.R. I can finally tell you how much I am loving this beef brisket technique. I never use liquid smoke when I make brisket. I use to but haven't been able to find one I think is worthy. Silly me, of course I should be able to now, the internet and google are before me each and every day! I'll get on it! The hickory smoked salt has been another problem. I had one a long time ago that I LOVED. You think I remember the name? Of course not:) I'll have to try again. Hi Fran, liquid smoke is good stuff -- and it'll make you think of smell-o-vision when you use it. ;-) Thanks for the comment. Hi Minnie, it's really worth bookmarking! ;-) Thanks for the comment. Hi Louise, I sometimes see brisket cut into pieces of maybe 2 pounds or so at my supermarket. You could ask yours if they'll do that. Or just use a big brisket and have loads of leftovers -- I've got a recipe coming next week that'll make good use of them. :-) Thanks for the comment. I have been SERIOUSLY JONESING some BBQ as of late!!!!!! Thanks for intensifying that craving! LOL! I am a Texas girl so I am all about the brisket, any way you want to cook it. Yes, I love a good smoke ring, but I love a baked brisket too. Your rub is spot on. Now, if I can just find a nice little one with some fat on it. Those are hard to come by here in Colorado. I love to bake when the weather is cool. It warms up our house and the slow baked food will warm up our tummies. 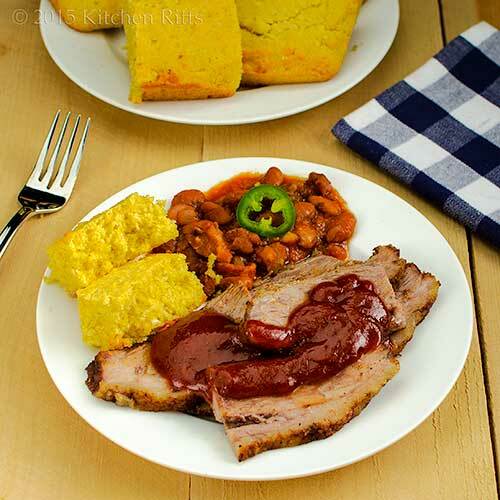 Love how you fuse slow cooking and BBQ together... Your beef brisket looks tender and yummy. Hi GiGi, this is work jonesing over. Seriously. ;-) Thanks for the comment. Hi Dottie, this is indeed much like a blue plate special! Truly tasty stuff. ;-) Thanks for the comment. Hi Karen, this does lack a good smoke ring -- just can't get it in the oven. But the overall flavor is quite, quite respectable. In fact it's good. ;-) Thanks for the comment. Hi Zoe, you'll want to think of this when it's winter -- probably too hot for right now. Although a low oven like this doesn't throw that much heat, now that I think of it. So you have no excuse not to make it in the summer! :-) Thanks for the comment. I think you just made my husband's day with this post. He is so into brisket. He always says it's one of the hardest things to smoke properly. It's the mark of a truly gifted grill master. Though lately the only kind of brisket I've made is a Jewish brisket, I need a dish to bring to someone that isn't feeling well. I know they like beef and since I don't eat beef, I could make this and save some for Manservant. It sounds like a great rub and might be a nice change from soup and all the chicken I'm sure she's getting. Thanks John for solving my problem! I think this will really moo-ve her! Hi Carolyn, your husband is right -- brisket is really hard to smoke. And nothing compares to a brisket smoked over live fire -- it's just the best. But this is darn good! And a bit easier -- always a plus. Thanks for the comment. Hi Abbe, the Manservant will love this! And if you make too much brisket (not possible, I think) I'll have a fun recipe for leftover bbq brisket next week. ;-) Thanks for the comment. Your brisket looks so moist and tender. It's so nice to leave something in the oven unattended and to be able to go about your day doing whatever you need to do. That's the best part of winter cooking, IMO! As for the liquid smoke, I do like the flavor but as you mentioned I'm not a huge fan of the odor in my home. It often lingers I think for days so cracking the window is a solution. This is a very inspiring recipe! Yes, we have slow-cooked brisket in warmer weather on the old Weber and I've even braised it on the stovetop, but never in the oven. Now I'm hungry for a brisket. I haven't used liquid smoke in years, but I did just make a beef stock using a bunch of bones from smoked short ribs this summer. It is a very smoky stock and I think it would be great for this brisket. Thanks for recipe and inspiration John! This carnivore loves the look of this brisket! So we meat again. Such a moooving story. What do you call a cow with no legs? Ground beef. Now that that's over, I love the look of your brisket! Gosh this brisket looks so good John! Funny, but I don't think I've made that many slow cooked recipes in the oven. I usually use the slow cooker. Do you think this recipe could fly in a slow cooker? (I think the broth would be touching the meat in a slow cooker). But a great idea about the tin foil snakey thing! And I'm putting in my vote for the BBQ Brisket Chili!!! Hi John, beautiful brisket, wonderful rub and recipe! I do love my thermapen too. One of the best purchases ever. Great advice about holding the brisket in a picnic cooler. Very informative post, as usual! Thanks! Hi Vicki, cracking the window is a good idea! Although we actually find the aroma rather pleasant. ;-) Thanks for the comment. Hi MJ, slow-cooking a brisket on the Weber is the best, IMO, but this is pretty close. There are different qualities between the two, and it's nice to have choices. That smoky stock of yours sounds delish! Thanks for the comment. Hi Maureen, lol! I was actually thinking of including the "ground beef" joke, but couldn't fit it it. Thanks for the comment. Hi Anne, I think in a slow cooker -- with this particular recipe -- it'd be more like braising the beef. But I'll bet one can modify this to work in a slow cooker -- I should work on that. ;-) And the chili is wonderful -- you'll like it, I think. Thanks for the comment. Hi Cheri, isn't this nice? Really good stuff! :-) Thanks for the comment. Hi Charlie, brisket served on buns is wonderful! With a bit of onion for me, please. ;-) Thanks for the comment. Hi Ansh, those Thermapens really are great, aren't they? Expensive, but worth it. Thanks for the comment. Hi Merryn, lol -- Mrs KR and I do like to chew things over in our conversations ;-) Thanks for the comment. This looks amazingly good, John....my mouth is salivating. All those flavors I know it is delicious. Plus that cornbread is perfect. Can't say much but three letters - YUM! I can smell the smoky flavour on this brisket! Yummy! Love your recipe! Thanks for the advice about holding the brisket in a picnic cooler! Hi Pat, it's wonderful stuff! Really great flavor. And we do like cornbread around here. ;-) Thanks for the comment. Hi Julie and Alesah, those three letters are all anyone needs to hear! Thanks for the comment. Hi Marcela, that picnic cooler trick is really interesting, isn't it? Thanks for the comment. Hi Kumar, this does indeed taste scrumptious! Thanks for the comment. Hi Pam, it is, it is! :-) Thanks for the comment. This looks delicious and love the use of the liquid smoke. That's a GREAT idea, John! I think I will do that on my next trip to the supermarket. Why I never thought of it is beyond me, lol...thanks!!! I had no idea you could barbecue inside. What a great cold-weather dinner solution! Woo hoo! Cooked over a slow, smoky fire works for me. And I really like all those good seasonings you used in the rub. Thanks for the recipe. Hi Rocquie, bbq brisket is much more common west of the Mississippi than east of it. Worth trying someitme -- it's good stuff! Although bbq pork is wonderful, IMO, and is actually my favorite. ;-) Thanks for the comment. Hi Louise, most supermarket butchers are pretty happy to do special requests, at least in my experience. Worth trying, at any rate! Hi Kristi, I'm big on meals that don't take too much attention, too! :-) Thanks for the comment. Hi Ashley, this really is tasty. And liquid smoke can have such wonderful flavor! Thanks for the comment. Hi Beth, BBQ purists would turn up their noses at this, but it's really good! Definitely good stuff. ;-) Thanks for the comment. Hi Pam, that rum really is sensational -- my absolute favorite! Thanks for the comment. Oh wow! This looks very tasty!!! Hi Peachy, it really is! :-) Thanks for the comment. I can imagine how lovely this must have tasted with that smoky flavor...wow! Hi Taruna, the flavor is really good! And this is easy to make -- my kind of dish! Thanks for the comment. Hi Raymund, isn't brisket great? I agree it has so much flavor! Thanks for the comment. Hi Rosemary, smoking outdoor on a smoker is wonderful! And you can get better flavor doing it that way than doing it indoors. But this is awfully good! Thanks for the comment. Your description of this dish moo-ves me to change the fact that I have never had brisket! I bet the smell of the garlic, onion and ground chipotle with that liquid smoke must make your house smell wonderful! Hi Shahi, good moo-ve on your part. ;-) And the house does smell delightful when this is in the oven! Thanks for the comment. Hi Dedy, it really is tender! And tasty. :-) Thanks for the comment. The last comment made me feel melty enhanced by the fact it was a pun. The brisket looks divine. If I was having super bowl at my house, that would definitely be the right dish. AND super bowl is on my mind, since I live in Seahawks country. GO HAWKS! As always, hilarious repartee! 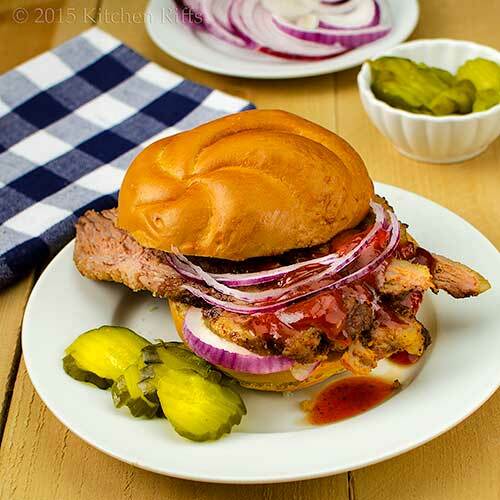 I discovered brisket late in life and you've now convinced me to cook one up for the big game! Thanks for the delicious inspiration. Hi Carol, no need to have a big Super Bowl bash at your house to have the rib -- just make it, and feast on the leftovers! Hope your team does well. :-) Thanks for the comment. Hi LIz, brisket is really good stuff. Really good. ;-) Hope you enjoy! Thanks for the comment. I've cooked almost every cut of meat you can imagine, but I've never made a brisket. I've always heard they're a little hard to make and have a tendency to dry out. I really like this recipe and the low and slow cooking method. I really need to give it a try. Great recipe, John! You had explained the difference between grilling and BBQ in the past here. I was telling the other day a friend that bbq and grilling was not the same, he didn't believe me. ^.^ I will direct him to your site. Thanks for this lip smacking recipe, I wish I could organize a BBQ. Happy weekend! Hi Bill, brisket definitely can dry out. But it won't with this method -- the water/broth in the oven helps keep it moist (as does tenting it with foil). Brisket is really good -- worth a try! Thanks for the comment. Hi Helene, I often say I'm going to BBQ something when I really mean I'm going to grill it -- but they are really two different methods. Thanks for the comment. It's almost dinner time and you have made me so hungry. But not for what I'm planning to make for dinner. I want one of those BBQ beef sandwiches so... much... Oh man! Hi Adri, Mrs KR and I would definitely enjoy life as your neighbor -- you're such a terrific cook! :-) Thanks for the comment. Hi Chris, BBQ brisket is wonderful in sandwiches, isn't it? :-) Thanks for the comment. Hi Nicole, liquid smoke is one of those ingredients that sounds as if it'd be nasty, but is actually rather nice. Thanks for the comment. You have me licking my chops already and I just finished dinner only a few minutes ago. I am all about a slow cooked and delicious brisket. I quite like the idea of serving it on a sandwich. This looks like it needs to hit one of of my Sunday supper rotations. Good Stuff! Hi Bam, your boys would love this dish! Loads of flavor, and it makes a lot. :-) Thanks for the comment. YUM YUM YUM! This looks awesome, John! We love good BBQ around here and this looks fantastic! Hi Amy, this really is yum. ;-) And easy -- wonderful combo! Thanks for the comment. Living in TX I have learned the "proper" definitions of grilling and bbq. LOL This brisket sounds delicious and not having to go out and tend to my smoker sounds even better. Hi Pamela, it was when I lived in Texas that the difference between the two was drilled into me. :-) Thanks for the comment. There is absolutely nothing as delicious as a tender beef brisket. (And, conversely, there is nothing as terrible as a tough-shoe-leather kind). Yours looks fantastic, John. Hi Debra, yeah, tough brisket is an abomination, isn't it? This is anything but! ;-) Thanks for the comment. Omg, yum yum yum. This is so perfect for cooler days. Sounds and looks delicious. Hi Asha, isn't this nice? Perfect for any day, IMO. :-) Thanks for the comment. i can't wait for the super bowl!! Hi GFHT, should be a good game! And if isn't at least the food will be awesome. ;-) Thanks for the comment. The oven really does the trick when you can't go outside, for sure! Great flavors here! 'Where's the beef?' ... you cracked me up, I still remember that ad! Hi Paula, we can't resist lame sayings and bad puns. :-) Thanks for the comment. Hi Kiran, it is, it is! ;-) Thanks for the comment. Funny, I was just thinking today that I need a good BBQ recipe and here it is. We rarely ever eat BBQs and I know my boys will love the change. Thanks John! Hi Mireya, this really is a good recipe -- tons of flavor, and pretty easy. My kind of dish! Thanks for the comment. and here's the brisket i just saw in your lovely chili! There are benefits to reading posts backwards, i say. :) You have some great tips here, which are always my favorite part of your posts; very helpful because i've had some bad brisket, and it's nice to really know what you're doing before you get into something so you can get it right. I especially like the liquid smoke note: the fake stuff is HORRIBLE and i can't abide it, so it's great you highlight the differences in the natural versus chemical stuff. Hi Shannon, I always feel as if using liquid smoke is cheating somehow. But the good stuff (the natural stuff) is pretty good. The chemical kind is horrible, as you say. Thanks for the comment. Hi Nami, you're way too kind! Glad you enjoy the Notes -- I do try to include a wide range of info in them. Thanks for the comment. John, this brisket sounds divine! I appreciate the notes you shared and really love your chat with Mrs K R. Thank you! Hi Hannah, it's really good stuff! And Mrs K R and I enjoy those chats. :-) Thanks for the comment.